During the operation of NID off-world teams, Colonel Grieves and Lieutenant Kershaw had visited Latona in an attempt to steal the technology for the Sentinel, a defensive weapon capable of protecting the entire planet. Since then, Grieves and Kershaw have been convicted of high treason, and SG-9 has tried to restore diplomatic relations with the Latonans. However, the planet is now under attack by Jaffa forces, and the Sentinel fails to activate. The earlier NID mission may have disabled the device, rendering the planet defenseless, and SG-1 must find a way to rescue the Latonans from attack. 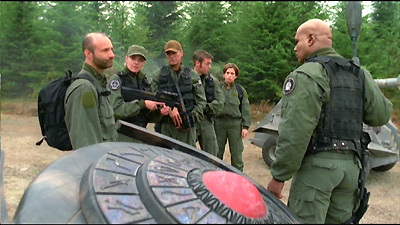 O'Neill visits Grieves in prison, but Grieves insists that the Sentinel is undamaged, and he demands that he and Kershaw join the return mission to Latona. On the planet, Grieves and Kershaw begin the process of breaking the code to the force field protecting the Sentinel, while O'Neill goes to the city to meet Marul, the Latonan leader, to convince him of the danger. The planet is overrun by Jaffa patrols, but Marul has complete faith that the Sentinel will not fail to protect his people. Even as Svarog's mothership attacks the planet from the air, O'Neill cannot convince him to evacuate. The Latonans have technologically regressed since the Sentinel was built long ago. No one knows how it works, but the Caretaker has always watched over it. When Daniel translates the symbols on the device as "Life Energy, Two as One," Kershaw recalls the Caretaker, a hermit encountered on their earlier mission. He had taken them by surprise, and Grieves had killed him. Now Grieves comes to understand the mysteries of the Sentinel. As Jaffa forces surround them, Grieves touches the device, two life forces, man and machine, joined as one, and the Sentinel activates. The Goa'uld invaders are enveloped in a blinding light, and vanish. Colonel Grieves and Lieutenant Kershaw had both served on NID off-world teams under Colonel Maybourne, had been arrested, convicted of high treason, and put on death row. They were offered a commuted sentence to help repair the damage done to the Sentinel. On an earlier mission, Grieves had stolen a powerful beam weapon from the people of P3Y-294, he was pursued and turned the device on his pursuers, killing all three. The government of P3Y-294 would have nothing further to do with the SGC even after the device was returned. While trying to take apart and decipher the Sentinel on Latona, Grieves had shot the Caretaker and allowed him to die, rendering the planet defenseless. The Latonans are a peaceful egalitarian society that has relied on protection from the Sentinel for 300 years. The civilization has technologically regressed in that time. Their written language is similar and possibly related to P2A-463. The Sentinel is protected by a force field that must first be deactivated. The code to shut off the force field is always changing, using a mathematical progression of the harmonics between the tones being emitted in each of over a hundred randomly changing patterns, relative to its spectral equivalent. The Caretaker wears a wristband that is a dead man’s switch, keeping the flame in Marul’s chamber burning as long as he lives. The symbols on the Sentinel mean “Life Force or Life Energy” and “Two as One”, indicating that the joining of man and machine is necessary to activate the Sentinel. The SG-9 diplomatic team, commanded by Major Benton and including Tarkman, Winters and Grogan, was on an extended mission to reestablish diplomatic relations with Latona. They were attacked by the forces of Svarog, and only Grogan survived. Svarog, one of the seven System Lords at the Summit, attacked Latona, and he and his forces were destroyed by the Sentinel. The new guidance system on the UAV can be used to paint targets on a planet to be taken out by missiles launched through the gate.